I would just like to point out straight away that poeliste is not a real word but it amused my Solognot neighbour Alain no end. We are thinking of putting a wood-burning stove in our downstairs living room (as I mentioned earlier this week) and the stove installer recommended by Alain came round to give us a quote. 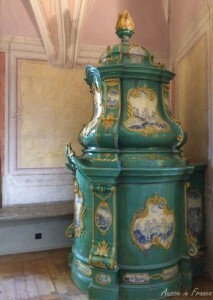 One of several porcelain stoves in Meissen in Germany – un poêle. The French for wood-burning stove is poêle from the Latin pensilis, meaning suspended, from the verb pendere, to be suspended, which gave pendent and pendulous in English. Pensilis may seem far removed from poêle, but remember that an ê in French often indicates that an “s” dropped out. In this case, the “n” got lost as well. Initially it designated baths suspended from vaults and heated underneath in all those rich Roman villas. After that it meant a heated chamber and eventually the cast iron or earthenware stove we know today. When poêle means a stove, it’s masculine. But listen to this. When it means a frying pan, it’s feminine. Same spelling, same pronunciation and everything. But it doesn’t come from pensilis. It comes from patella meaning a small dish. Patella first became paielle then paele and maybe poesle (1579) which would explain today’s poêle. 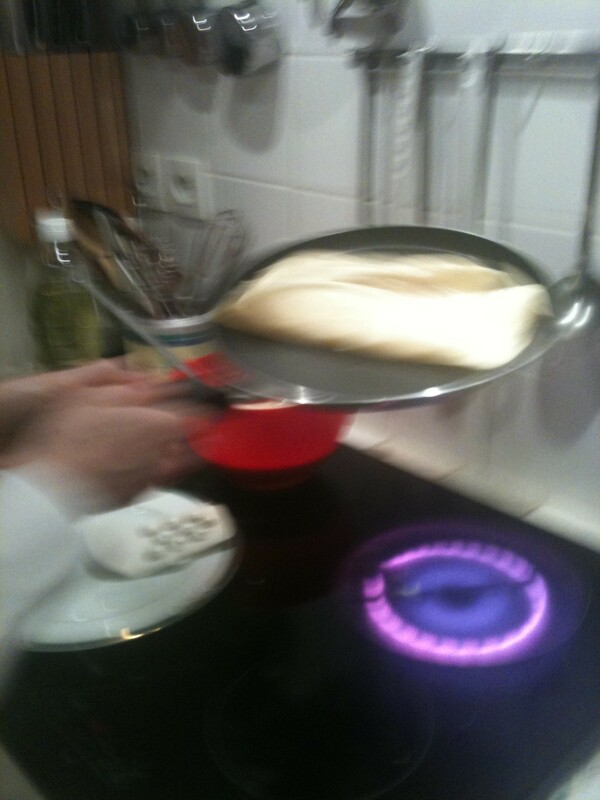 A small frying pan is a poêlon, which of course is masculine. How we’re supposed to remember that I don’t know. I based my use of poêliste on fumiste (from fumée, smoke) which means heating mechanic and also chimney sweep, although the more usual word is ramoneur. But fumiste has another meaning – a shirker. I asked Alain why but he didn’t know. Good old Wikipedia came to the rescue. Apparently it comes from a vaudeville show called La Famille du fumiste about a heating mechanic who wasn’t the sort of person you could really count on! This entry was posted in French language, Uncategorized and tagged Friday's French, fumiste in English, poêle. Bookmark the permalink. Boy have I lost a lot of my French! I’ve had several hilarious conversations where I’ve mistaken poêle for poil. his wife arranged a replacement…. installed a bit that was incorrect and dangerously fitted…. and at last we’ve found an engineer who knows the system, is efficient, is willing to stay until 9PM to make sure things are working correctly. after trying for three years to find someone who could install and maintain a modern woodburner…. and not try and sell us a glorified heat exchanger…. I mentioned the magic words “Lambda System” and they vanished…. never to be heard from again!! Goodness, Tim, sounds horrendous! We’ve had two visits. The second has already successfully installed an excellent woodburner at Alain’s place, so we know the work will be done properly. Plus JM is going to be watching every move … his speciality is heating and air-conditioning and he’s been studying it all up. I promise, next Friday’s French will be on “poil” !!! I like to look of that crepe! It brings back memories of when Lisa taught me to make crepes when she was with me here in Oz in 2000. I have just finished 900 school reports and need something like this to celebrate. Oh well, a few prawns and bugs followed by pavlova – on my deck tonight – will have to do. 900 school reports! Sounds much worse than 20,000 words of translation. Enjoy the prawns, bugs and pavlova.